Last months have been crazy about spinning. No activity on the blog and on the prawelewe platforms has the only one explanation: spinning is so engaging and rewarding, and enjoyable that I see no point in wasting time for turning on my computer, not to mention about editing photos or writing about my endeavours. 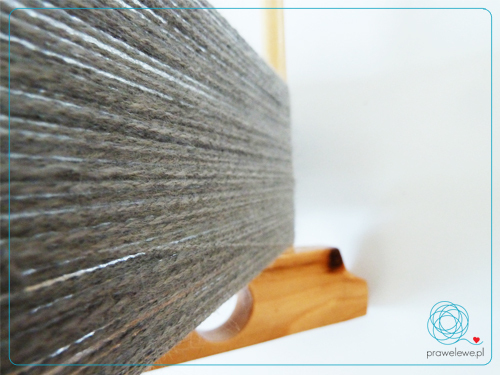 On the other hand, every time I see my last post about Easter, I think that it is really the time to fulfill my promise that I gave long time ago in my prawelewe group to write about my tools and fibre preparation. There are some materials for those articles already in my drawer but the texts and photos are still to be organised before I publish my surprise series, so please bare with me. I want to spread some good vibes, though, so let me share about my latest activities. 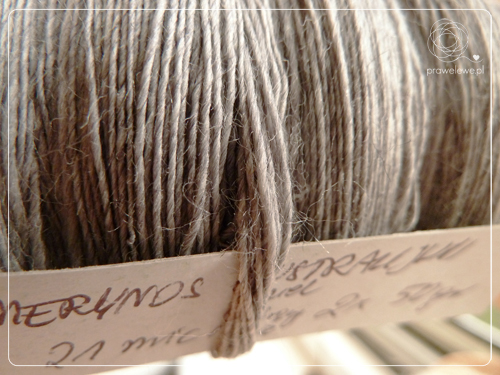 Today I am going to show you some new hanks, which I am planning to use for a set of three shawls, each in two colours. They will have one thing in common- a ring. No more details for now. Does this sound mysterious enough? Hope so! I plied both of the singles into S, and got ca. 250 m/ 50 grams of grey and ca. 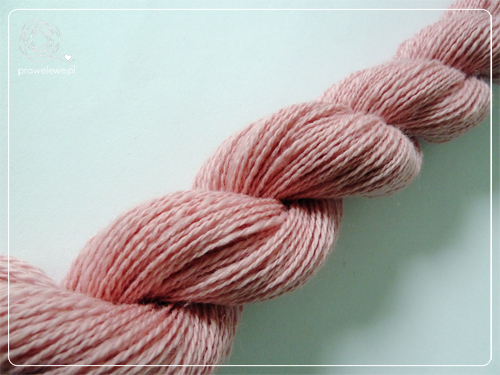 220 m/ 50 grams of pink. There will be two or three hanks more of each colour before I begin knitting. 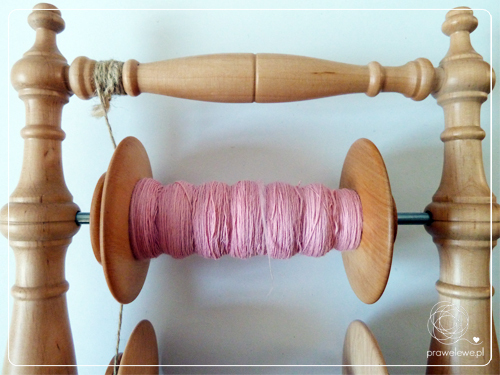 The draft design is already ready and I have estimated the amount of materials needed but in case I need additional yarn, it will be possible and easy for me to spin more for myself. And I so love this feeling of no need to worry about metrage. 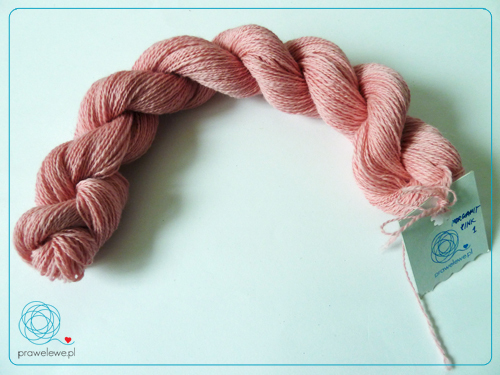 Using this special occasion (this is the first post related fully to my hand-spun yarn with use of my lovely Polish Polonaise spinning wheel from Kromski family), I want to share the joy of having my very own, special, amazing and meaningful prawelewe stamp! It is a gift from my dearest friend- Irishmagda, who ordered it from Ireland and sent to me as a gift. Aren’t the hanks and their tags lovely? 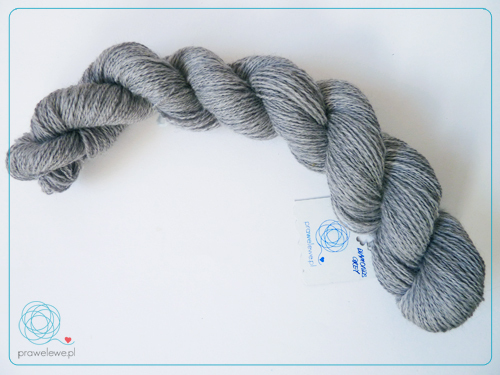 The shawl I am going to make of this yarn will be so beautiful. It has to! The stamp will show up here and there many times more on this page for sure. I have already planned using it with my MAK markers.Oh, did I say that some new MAK sets are on their way? This entry was posted in gossips, MAK jewellery, spinning. Bookmark the permalink. Downloaded your pattern and enjoying making the knit octopus. Hoping some local hospital will take them, if not they will be part of gifts for new babies. I used another pattern before finding yours and for the tentacles I had to kfbf instead of kfb and they spiraled. My tentacles are not spiraling like the ones in your pattern. Any idea why?